The present-day Universe is a rich collection of galaxies of many types, clusters of galaxies, large scale structure and exotic phenomenon (e.g. Galactic black holes). The galaxies themselves contain stars of all sizes, luminosities and colors, as well as regions of gas and dust where new stars form. We suspect that many stars have planets, solar systems in their own right, possible harbors of life. So what's going to happening in the future?? If the Universe is closed, then we might expect the arrow of time, as defined by entropy to reverse. There appears to be a natural connection between the expanding Universe and the fact that heat moves from hot areas (like stars) to cold areas (like outer space). So if the expansion of space were to reverse, then would entropy run the other way? This kind of Universe has no real beginning or end, and is refered to as an oscillating Universe. Notice that it's impossible to determine which side you currently are on since time reverses and all appears normal to the observer. The past history of the Universe is one of an early, energetic time. As the Universe expanded and cooled, phenomenon became less violent and more stable. This ruling law of Nature during the evolution of the Universe has been entropy, the fact that objects go from order to disorder. There are local regions of high order, such as our planet, but only at the cost of greater disorder somewhere nearby. If the Universe is open or flat (as our current measurements and theories suggest) then the march of entropy will continue and the fate of our Universe is confined to the principle of heat death, the flow of energy from high regions to low regions. With this principle in mind, we predict the future of the Universe will pass through four stages as it continues to expand. The Stellar Era is the time we currently live in, where most of the energy of the Universe comes from thermonuclear fusion in the cores of stars. The lifetime of the era is set by the time it takes for the smallest, lowest mass stars to use up their hydrogen fuel. The lower mass a star is, the cooler its core and the slower it burns its hydrogen fuel (also the dimmer the star is). The slower it burns its fuel, the longer it lives (where `live' is defined as still shining). The longest lifetime of stars less than 1/10 a solar mass (the mass of our Sun) is 1014 years. New stars are produced from gas clouds in galaxies. However, 1014 years is more than a sufficiently long enough time for all the gas to be used up in the Universe. Once the gas clouds are gone, all the matter in the Universe is within stars. Once all the matter has been converted into stars, and the hydrogen fuel in the center of those stars has been exhausted, the Universe enters its second era, the Degenerate Era. The use of the word degenerate here is not a comment on the moral values of the Universe, rather degenerate is a physical word to describe the state of matter that has cooled to densities where all the electron shell orbits are filled and in their lowest states. During this phase all stars are in the form of white or brown dwarfs, or neutron stars and black holes from previous explosions. White and brown dwarfs are degenerate in their matter, slowly cooling and turning into black dwarfs. During this era, galaxies dissolve as stars go through two-body relaxation. Two-body relaxation is when two stars pass close to one another, one is kicked to high velocity and leaves the galaxy, the other is slowed down and mergers with the Galactic black hole in the center of the galaxy's core. In the end, the Universe becomes filled with free stars and giant black holes, leftover from the galaxy cores. The Universe would evolve towards a vast soup of black dwarf stars except for process known as proton decay. The proton is one of the most stable elementary particles, yet even the proton decays into a positron and a meson on the order of once per 1032 years. Thus, the very protons that make up black dwarf stars and planets will decay and the stars and planets will dissolve into free leptons. This all takes about 1037 years. Once all the protons in the Universe have decayed into leptons, the only organized units are black holes. From Hawking radiation, we know that even black holes are unstable and evaporate into electrons and positrons. This process is extremely slow, varying inversely as the mass of the black hole. For Galactic mass black holes the time to dissolve can last up to 10100 years. The result is a bunch of photons, slowly cooling in the expanding Universe. After all the black holes have evaporated, the Universe consists of an expanding sea of very long wavelength photons and neutrinos. This is a system of maximum disorder, no coherent structures or objects. No sources of energy, and no sinks as well. The rest of time is simply a continual lower of energy until the state of quantum vacuum is reached. While interstellar distances are vast, perhaps to vast to be conquered by living creatures with finite lifetimes, it should be possible for an advanced civilization to construct self-reproducing, autonomous robots to colonize the Galaxy. The idea of self-reproducing automaton was proposed by mathematician John von Neumann in the 1950's. The idea is that a device could 1) perform tasks in the real world and 2) make copies of itself (like bacteria). The fastest, and cheapest, way to explore and learn about the Galaxy is to construct Bracewell-von Neumann probes. A Bracewell-von Neumann probe is simply a payload that is a self-reproducing automaton with an intelligent program (AI) and plans to build more of itself. Attached to a basic propulsion system, such as a Bussard RamJet (shown above), such a probe could travel between the stars at a very slow pace. When it reaches a target system, it finds suitable material (like asteroids) and makes copies of itself. 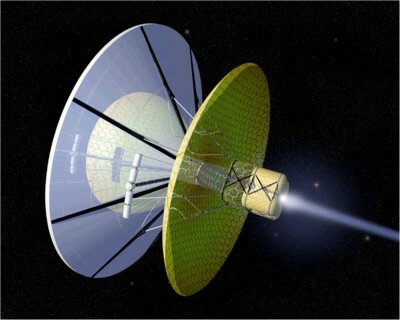 Growth of the number of probes would occur exponentially and the Galaxy could be explored in 4 million years. While this time span seems long compared to the age of human civilization, remember the Galaxy is over 10 billion years old and any past extraterrestrial civilization could have explored the Galaxy 250 times over. Thus, the question arises, if it so easy to build Bracewell-Von Neumann probes, and they has been so much time in the past, where are the aliens or at least evidence of their past explorations (old probes). 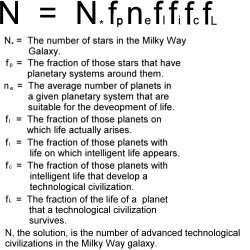 So Fermi Paradox becomes not only where are They, but why can we not hear Them and where are their Bracewell-von Neumann probes? UFO's, Ancient Astronauts, Alien Artifacts: all fall under the heading of proposals that aliens are here now or have been here in the recent past. Problem: evidence for aliens is non-existent. The aliens are here, and they are keeping us in a well designed zoo (cut off from all contact) or there is an interdiction treaty to prevent contact with young races (us). Problem: scenario lacks the ability to be tested. Takes only one ET to break embargo. Speed of light slows communication levels, relativity makes space travel long. ET's message may not have reached us yet. Problem: Galaxy has been around for billions of years, even if one ET civilization formed a few million years before us, the Galaxy would be filled with Bracewell-von Neumann probes. EM radiation, gravity waves, exotic particles are all examples of methods to signal. Problem: they may use methods we have not learned yet, but if there are many civilizations someone would use EM methods. The Galaxy is filled with killer robots looking for signals. ET is keeping low. Problem: where are the berserkers coming after us? ET has no interest in conversing with lesser beings. 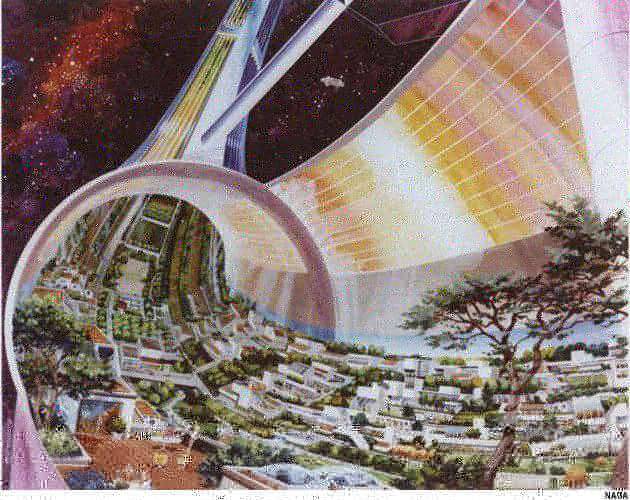 Problem: with millions of possible civilizations, someone would have some curiosity. Mathematics is the universal language. But humankind may have a unique system of mathematics that ET cannot understand. Problem: then where are their incomprehensible signals? Life is new to the Galaxy, evolution takes time, we are the first civilization. Problem: Sun is average star, if other stars formed a million years ahead of us, then They would be a million years ahead of us in technology. In general, solutions to Fermi's paradox come down to either 1) life is difficult to start and evolve (either hard for the process or hard to find the right conditions) or 2) advanced civilzations destroy themselves on short timescales. In other words, this is an important problem to solve in the hope that it is 1 and not 2. This course has been an exploration into modern cosmology and the search for the final laws of Nature (a theory of Everything) and the origin of Universe. Although there are many, many unsolved riddles to the Universe, the basic picture known as the Big Bang model is, at the very least, the foundation whose basic properties will always remain unchanged. Although many of the concepts discussed in this course are strange, they are all based on rational scientific thought (the real world is stranger than anything you can imagine). A proper scientific model leaves less room for irrational beliefs. Understanding within the scientific method removes the blank areas on our maps, the place were we once drew monsters and golden cities. This knowledge dampens our fears like a candle in the dark.